Geometric Sequence, just when you think they can't make it sound any scarier. According to Dictionary.com a sequence is something that follows something else. A Geometric Sequence or Geometric Progression (they mean the same thing) is a sequence of numbers where each term after the first is a multiple of the previous term. The number and/or variable that is the multiplier is called the common ratio. Is this a Geometric Sequence? If you are asked if a sequence is geometric, find out if a common ratio exists. what times the first term equals the second? If I multiply that amount times the second term, will I get the third term? If so, it's a geometric sequence and that multiplication amount is the common ratio. If not, then it's some other kind of sequence. Looks pretty impressive, doesn't it? Here's what it means. Let a be any number or variable or combination of numbers and variables. It's just some term. 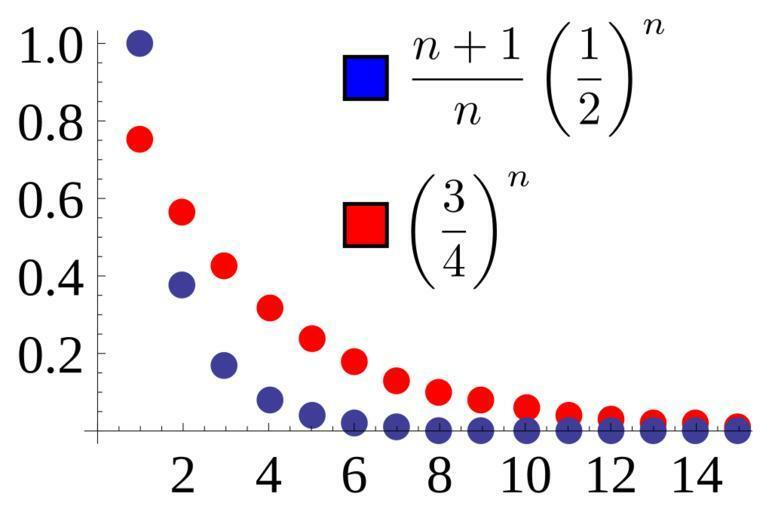 If n = 1, then it's the first term in the sequence. If n = 2, then it's the second term, and so forth. n acts as a counter, telling us what term we're referring to. r is the common ratio, it's the thing we multiply times each term to get the next term. Now, let's try this out with an actual easy example. 1, 2, 4, 6, 8, ... Hopefully you can see that we multiply each term times 2 to get the next term. So, our common ratio is 2, in our general formula we labeled it r.
a1 is 1, Because our very first term is 1. Lets use this formula to figure what a2 will be (we know it should be 2). a2 = 2a2-1. Because r=2 and n=2. a2 = 2a1. That 2 snuggled up next to the a1 means we're multiplying. But we know that a1 is 1, and 2*1 = 2. Let's try term #3. r=2 and n=3 (we should get 4). a3 = 2a3-1. Because r=2 and n=3. a3 = 2a2. But we know that a2 is 2, and 2*2 = 4. If you are still even slightly unsure, try to use the formula to find term #4 or any other term in the sequence. O'k, that worked well to find the next term. But what if I wanted to find term #130 and didn't want to waste time finding each of the previous terms. Well, there's a formula for that, and here it is. a130 = 1(2)130-1 I put a parenthesis around the 2 (my r value), to separate it from the 1 (my a1 value), if I didn't it would have looked like 12. So, we end up with a130 = 2129 and now we really need a calculator. It ends up being 348,449,143,727,041,000,000,000,000,000,000,000,000,000 or 348 quattuordecillion 449 tredecillion 143 duodecillion 727 undecillion 41 decillion. That's if you live in the United States. Unfortunately, when we get past a million different countries, even those who share our numbering up to a million, seem to go there separate ways. While a Googol is 10100 in the USA, the UK and Denmark, it is 10 duotrigintillion in the USA, 10 sexdecilliard in the UK, and 10 Sexdezilliarden in Denmark. Go figure.